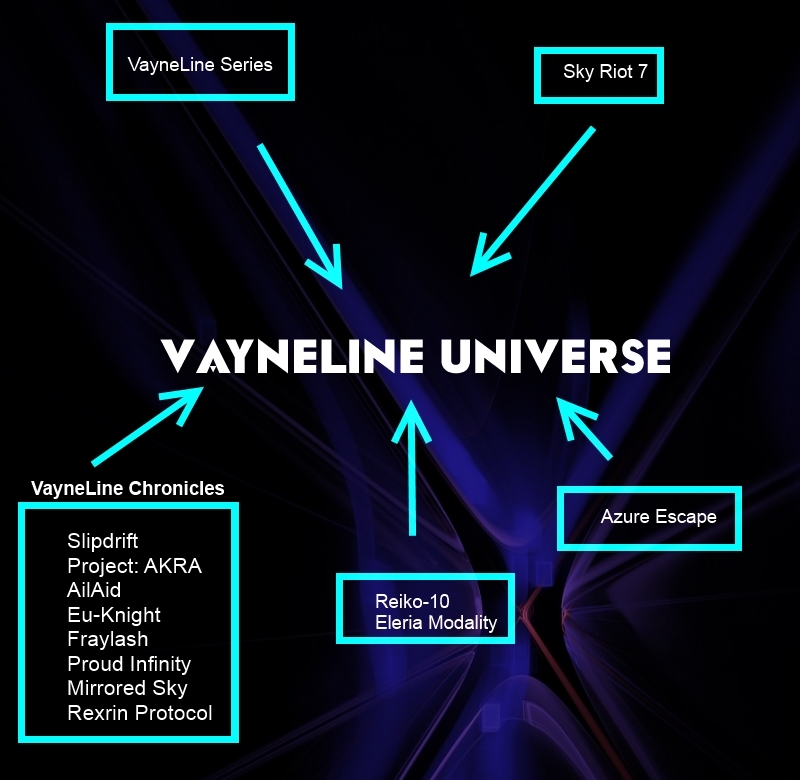 This is a quick summary of the VayneLine Series so you can understand some of the major themes. Reality is more malleable than we may expect and that time flows only down certain paths, invoking both a ‘destiny’ and a freewill, many characters find out there are ways to break out of these paths, but often at high cost. The backdrop for most of the stories is that in the future humanity has been saved from nuclear and environmental devastation by the powerful Aelisha race, in turn acting as a sort of shock troop for their battles we are giving advanced technology like Jump Drives, genetic engineering and custom nanites to maintain our bodies. All life energy is eventually recycled through the ‘Line’, leading to what many believe as a pseudo-resurrection potential as well as strong galactic spirituality. Eventually many alien races (along with certain humans) start to find out that this concentrated life energy has a hidden power. In certain circumstances it provides a way to create local realities, and this is a secret of tremendous power that many are after. Throughout all the stories there is a very strong undertow of spirituality, esoteric philosophy, and concepts designed to challenge the reader in regards to their own thoughts about freewill and spirituality. Together they weave a comprehension fabric of what reality may indeed be like for those of us on the bottom dimension of a complicated framework around us. Though the VayneLine series is written as a sci-fi it is intended as a very real idea of a potential for us, especially in regards to a spiritual reality we may find ourselves in. Please email any comments, questions, thoughts or fanart to vayneline@mail.com and I will respond and even feature fanart. I started writing about ten years ago seriously, most of it was just for my own fun. I worked a few different jobs, some of which involved a lot of action and helped write realistic action scenes. I started putting my writing out only a few months ago near the start of 2017 so very new to this whole process still. This picture tells better than I can, the simply answer is they are all part of the same overall narrative.